Indonesia is a multi-ethnic country; diverse in every way. Rich in food and culture. Home to more than 230 million people belonging to 700 linguistic groups living in 34 provinces. 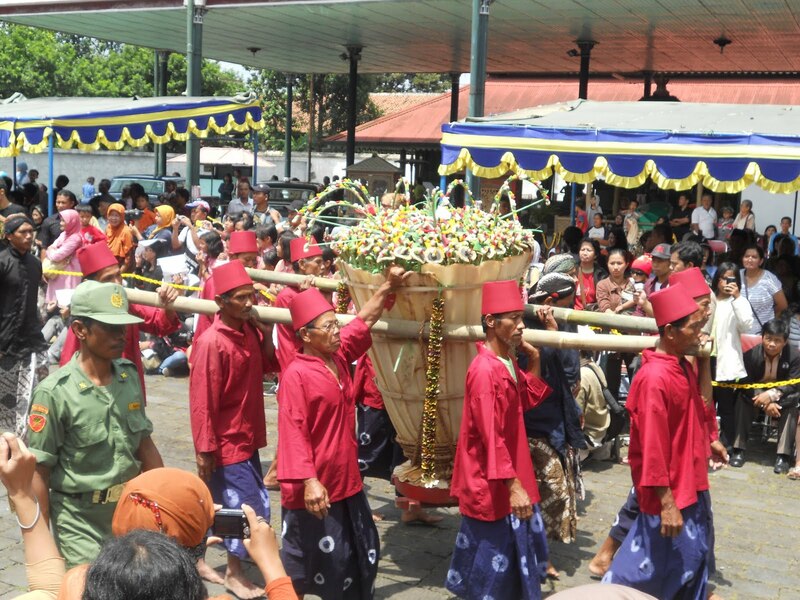 All the cultural groups in Indonesia have their own festivals and customs. 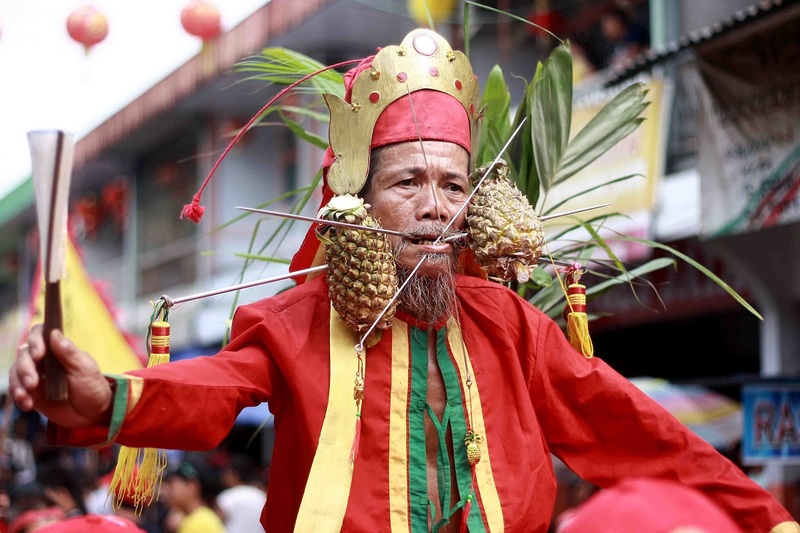 Let’s take a tour of what some of the festivals in Indonesia look like. 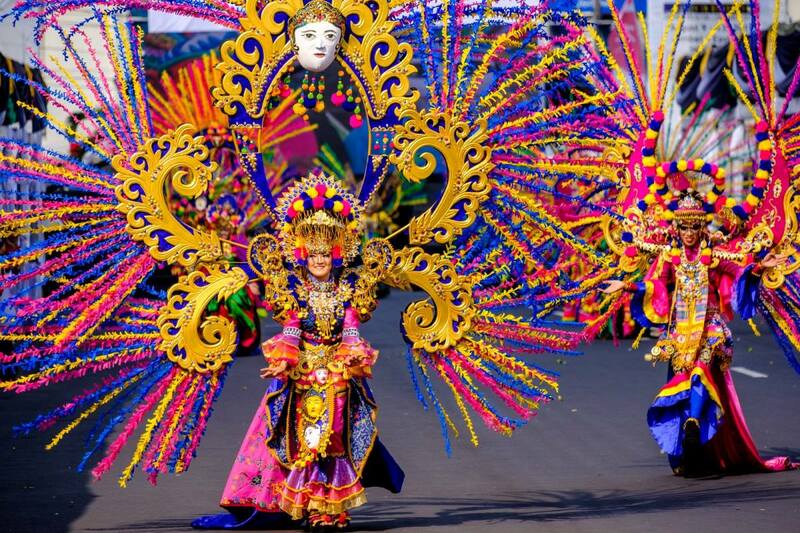 This carnival is held in a city in East Java called Jember. Jember Fashion Carnaval is one of the quirkiest festivals of Indonesia that has caught the eyes of fashion lovers from across the globe. It was first held in 2001 and has become the emblem of contemporary culture of East Java. This festival is a platform for the local fashion designers to display their work to Indonesian as well as international fashion industry. Catwalk is 3.6 kms long. It is the seventh biggest carnival in the world. It is usually held in August. 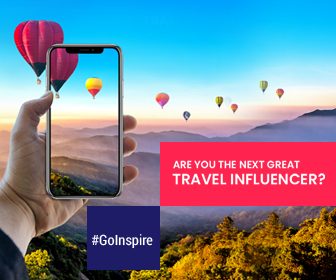 Dates for 2019 are yet to be released. The name of the festival is derived from the Arabic term “Syahadatain”. Sekatan is a seven day festival celebrated to observe Maulid i.e. the birthday of Prophet Muhammed. When: Celebrated every year from the 5th day to the 12th day of Mulud month in Javanese calendar (or Rabiul Awal in Islamic calendar). Where: Festivities are generally held in northern Alun-Alun (square) of Yogyakarta and Surakarta. Main Event: Grebeg Muludan that takes place on the twelfth day at 8 am is the main event of this festival. This is the time when Prophet Muhammad was born. Rituals: A model of Gunungan (mountain) is made from sticky rice, sweets, different types of food, crackers, fruits and vegetables. Gunungan is protected by ten units of bregodo (brigade) of royal guards of Kraton Yogyakarta. After the prayers are done, people pick, fight over and rip apart Gunungan as it is believed to bring luck and wealth. 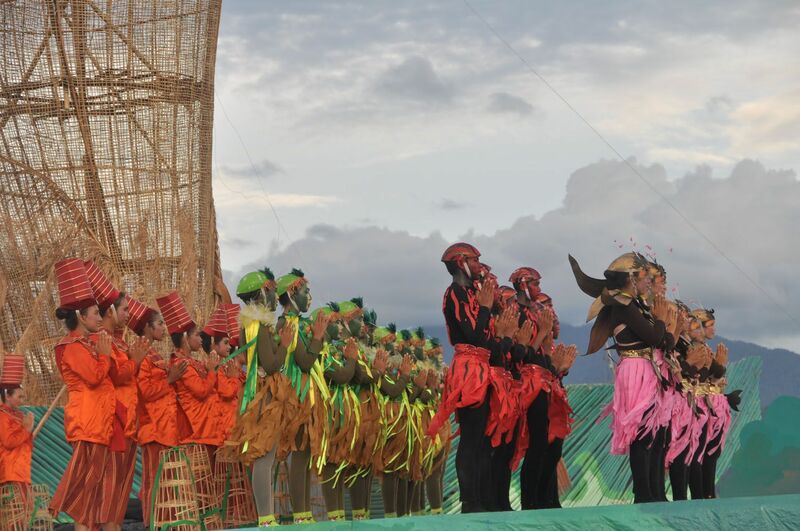 It’s a beautiful annually held festival celebrating life and culture of Indonesia by the Regency of West Halmahera. Rituals: the opening ritual consists of purifying the sea water and then other events are held emphasizing the exquisiteness of eastern Indonesia. Quirks: An underwater photo competition is the centre of attention for all the photographers and divers. 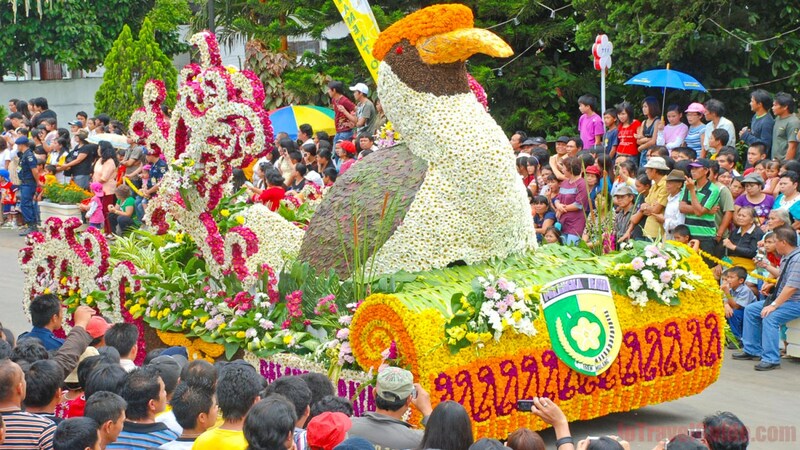 Tournament of flowers: It is a parade of vehicles beautifully decorated with flowers. Neighboring countries of Indonesia, regencies, cities, or even companies can participate in this event. This festival is one of its kind is definitely worth attending at least once in a lifetime. Pasola festival is celebrated to show gratefulness to the spirits of ancestors from West Sumba, and East Nusa Tenggara. 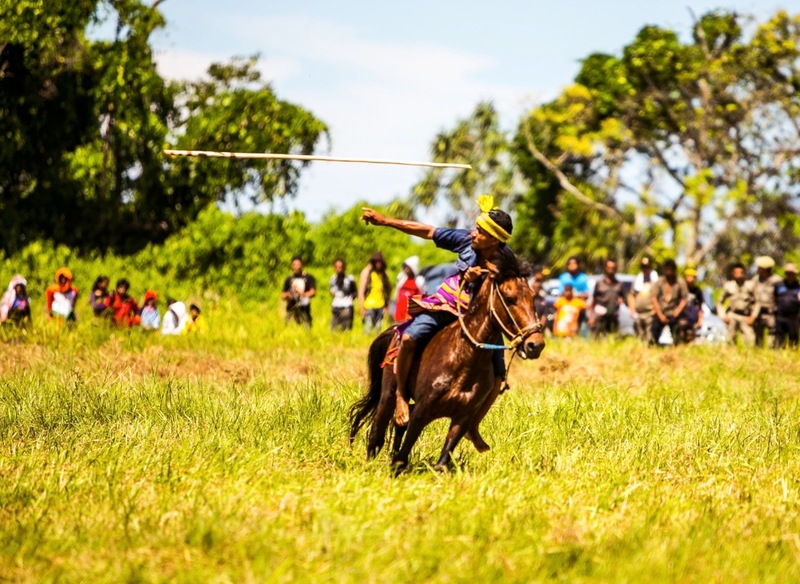 Pasola was an ancient war ritual of Sumbanese men where they used to ride on skillfully adorned horses and hurl spears made of wood towards each other. They believed that their spilled blood would fertilize the land and lead to more production of rice. The main festival generally begins a few days after the full moon and corresponds with the annual influx of colourful sea worms known as Nyale to the shore.